Approximately 12 participants joined the workshop representing accountancy practitioners, Scottish Government, SMEs, public sector bodies, academics, and third sector. Paul initially gave a brief (30mins) presentation covering the key benefits of carbon information can support business with their strategic and operational decisions. 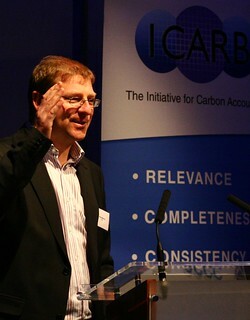 The themes supported by Scottish Case Studies explored how carbon information helps identify operational inefficiencies, and stimulates innovation, and with stories can enhance reputation. The workshop highlighted that for effective staff engagement it may require avoiding the term “carbon”, and focus on the key drivers (i.e mpg for fuel efficiency). Finally the workshop explored the supply chain impacts for SMEs, and highlighted how Global CEOs will demanding more from their supply chain to reduce both the cost base and carbon impacts. In summary carbon information needs to be relevant to underlying business objectives and strategy in order for decision makers to buy-in. Do business really understand what 10Tonnes of carbon means? Is there a two tier carbon management system operating between SMEs and larger companies? Initial carbon measures are intangible to businesses but combined with actions that commercially beneficial carbon gradually becomes a KPI. The quantity is not important to SMEs, it is the direction of movement which grabs attention and stimulates investigation. Example given of the need for better / more easily accessible data on embodied energy for the construction industry. From the open discussion the tables selected three topics to discuss further. Firstly, it is not necessarily detrimental to have two tiers , or more as long as the systems are relevant to the business groups. For instance, supply chain pressures will be different for local networks compared to SMEs engaging in the global supply chain and economy. However what this means in practice is that SMEs aim to account for Scopes 1 and 2 and then waste, because SME (and public) awareness is higher and waste is easier to account for. Whilst this shows that some levers are working to help SMEs increase their disclosure, it raises the question of what more could be done to enable them to report other categories over which they have some influence, such as employee commuting. The group were not in favour of further legislation but supported the idea of an incentive scheme using bronze, silver and gold awards, as used in the Scottish Sustainability Label, and assessed using a matrix-based scoring system covering different carbon reduction activities. The idea being to use gamification to drive competition. Discussion touched on our effective public sector procurement evaluation can be to signal the need for better carbon information from businesses tendering for contracts. For Transport Scotland a Bronze, Silver Gold matrix is being developed with specific benchmarks required for each band. Criteria could include company KPIs for management carbon and energy impacts. The Accountancy Practitioner commented that the Company’s Act 2006 already provides legislation for the inclusion of relevant KPIs used to manage the business. The table considered that including relevant Non-Financial KPIs in the procurement evaluation criteria could strengthen disclosure in the financial statements. In addition, requesting carbon intensity ratios (and Non Financial KPIs) in the public procurement evaluation, along with narrative regarding management programmes, would give a good indication of the quality of the management system behind the numbers. However, the evaluation weighting has to be sufficient to shift the cost benefit ratio towards disclosure. There was discussion regarding terminology and the advantages of “dropping Carbon” from the language used to engage staff. Importantly, the group felt is was key to use language that is relevant to the staff’s role and to explain the importance of reporting carbon data. With respect to motivating staff, it is less critical to talk about carbon reduction, but to focus on how staff can impact the carbon position , i.e. reduce paper use, reduce waste materials, turn off equipment, drive efficiently. A question here is how well emphasising carbon reduction works compared to emphasising resource scarcity. A further question was how useful biodiversity would be as a metric. The group had a detailed discussion of what sort of tool would be best for communicating carbon literacy, and came up with the suggestion of an application that takes staff through a simple introduction to the subject. This would include explanations of key terms such as climate change and Global Warming Potential, and be able to log who has viewed it. The information would need to be kept as simple and engaging as possible. Ecometrica reported that their comic book-style guides (available on their website) had doubled their click through rate on publications, and the Ewegeco meter was cited as another good example of simplicity. There is a balance to be struck between simplicity and complexity in communicating carbon to decision-makers in a company. Ultimately this will be driven by regulation or incentives so messages need to stress the relevance of these to the company. Public Sector Evaluation to weight in favour of carbon KPIs that are reported in the financial statements. Accountancy Profession to encourage business (SMES) to report Non financial indicators in the directors report. Use “Carbon” and “Sustainability” sparingly, if at all in discussions with staff in order for actions to be meaningful and relevant. After leaving PwC, Paul studied for an MSc in Environmental Studies at Strathclyde University, achieving a Distinction plus recognition for his dissertation. After graduating, Paul worked for the Business Environment Partnership before striking out on his own and forming SOS. Paul has over ten years’ experience of providing assurance and risk assessment services to multi-national companies in the UK and Japan. As a result he has experience of numerous industries, giving him an in-depth knowledge and understanding of financial and environmental systems. Dr Keith Baker is Research Associate in Sustainable Urban Environments at Glasgow Caledonian University. Along with Prof Sue Roaf he co-founded ICARB (then the Scottish Carbon Accounting Group) in 2007, and is co-author of the book Carbon Management in the Built Environment (Routledge, 2012). He has a background in environmental science and science and technology policy, and his main research interests relate to energy and the built environment, with clients including the Scottish Government, ClimateXChange Scotland, and Historic Scotland. Keith also specialises in electronic waste and environmental impact of technology, on which he is a columnist for The Display Standard and a contributor to the Handbook of Visual Display Technology (Springer, 2012); and is a science communicator with organisations including STEMNET and the English Speaking Union. Keith lives in Edinburgh with his partner and their guinea pigs. For more content from the 5th International Conference visit our Conference 2013 main page. This entry was posted in Industry Presentations, SME Presentations on May 6, 2013 by Ric.